As you can see, the finish of this travertine was dull. 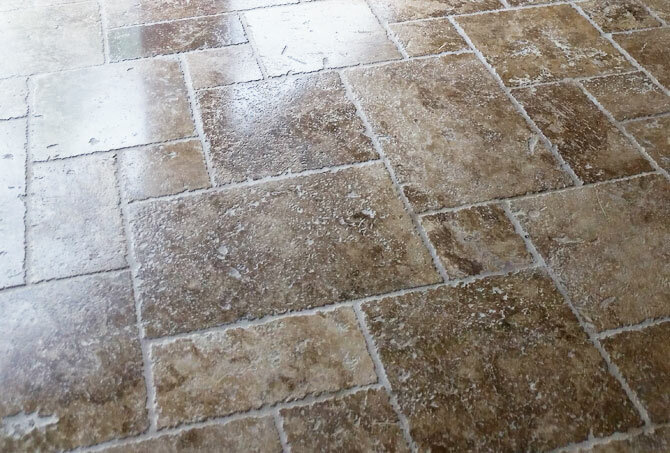 This is the travertine after the old sealer was removed but before it was polished. This travertine looked so much better with the old sealer removed and the appropriate sealer applied. We achieved a natural polished finish that did not require the use of topical sealers. One of the most common calls we get is from clients who have recently had their exterior natural stone refinished and sealed with inappropriate and problematic sealers by restoration contractors who lack the proper knowledge and experience. Unfortunately, the cost ends up being three for four times what it should have been by the time all is said and done. 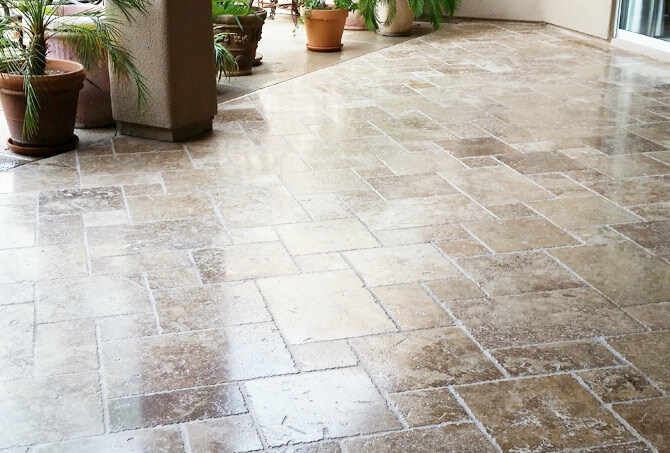 This Scottsdale patio had been sealed with a topical sealer, which failed within months due to UV exposure from the intense Arizona sun. 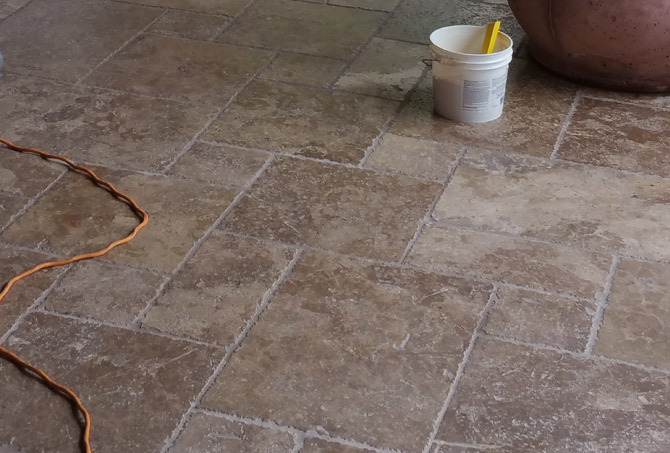 The previous contractor had attempted to give the travertine a shiny appearance, per the client’s request, without realizing the beautiful shine would be temporary. Keep reading to learn how we resolved the problem. First, we stripped the topical sealer. Then, we honed and polished the stone to achieve a beautiful, lasting, natural polish. We finished up with an application of penetrating enhancing sealer, achieving the look the clients wanted without any worry about a future product failure. The homeowners were very pleased with the results. To learn more, visit our Travertine Services page and watch this video. 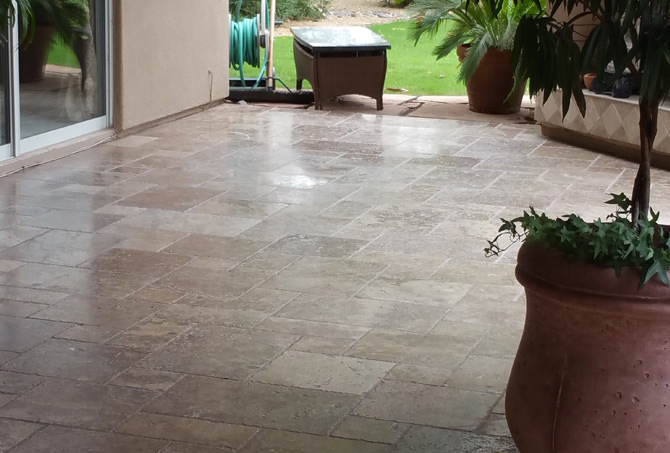 For a FREE estimate on exterior travertine stripping, refinishing, and sealing services throughout Scottsdale, as well as the Phoenix and Tempe area, use our contact form or call (602) 993-9800 today.